Epner Technology, precious metals plating including Laser Gold - EPNER TECHNOLOGY INC.
We have been told that our site is really interesting and browers are welcome, BUT to save time we have summarized our plating processes, the markets we serve, and some of our ancillary capabilities, plus a few testimonials, all in the column on the right. We are a 100 year-old specification plating company, specializing in the high-tech markets of Space, Medical, Defense, and the contract machinists that service those industries. Please read our unconventional Mission Statement. Epner Technology’s proprietary 24 karat gold process, Laser Gold, achieves the theoretical IR reflectivity and ultra-low emissivity of a pure gold. With a Knoop hardness of almost 200, Laser Gold is three times harder than any other pure gold plating process. 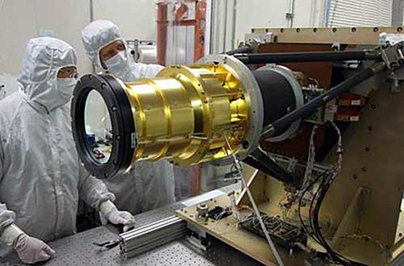 Specified by NASA for thermal control of instruments, Laser Gold is aboard virtually every spacecraft from the earliest GOES weather satellites to the infrared cameras on the Hubble and the James Webb Space Telescope. 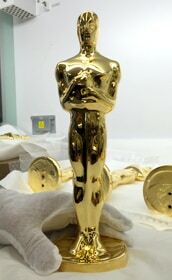 In 2016, the Motion Picture Academy, for the first time, chose Laser Gold to adorn one of the most recognized symbols of quality in the world… the Oscars! The Academy Awards ceremony is probably the last place most people would look for NASA technology, but it turns out the Space Agency has had an impact even on the glammest of Hollywood red carpets: the coveted Oscar trophy. 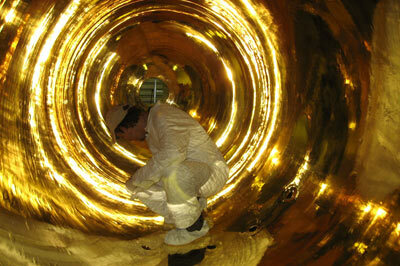 Our inspector inside of a 3 meter high chemical reaction vessel. The ultra-high infrared reflective performance of Laser Gold®, dramatically increases the efficiency of this water-cooled device. 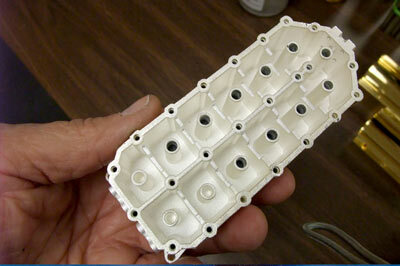 Plastic microwave filter housing. Injection molded Ultem® plastic plated with 2.5 microns High-Q Silver®. One of thousands produced during the telecom boom. Space Instrument. 0.5 meter in diameter. 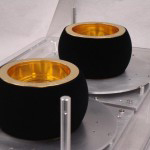 Ultra-low emissivity Laser Gold® contrasting the high emissivity Laser Black. One quadrant of the Alpha Laser beam clipper. Laser Gold® over a diamond-turned copper substrate. This Laser was the heart of the missile defense concepts of Star Wars. The full beam clipper being installed in the laser. Infrared light pipes lined with Laser Gold®. Sometimes called homogenizer's, or hollow waveguides, these custom fabricated light guides are made by a process known as electroforming. Often used in gas sensors, the interior surface roughness is measured in Ångströms. Aluminum machined housing. Electroless Nickel plated followed by Gold plating to MIL-G-45204 . for the Multiscale Magnospheric spacecraft. 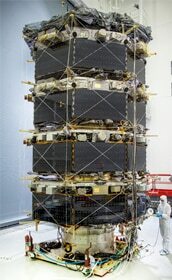 (MMS) A yet to be launched NASA mission. 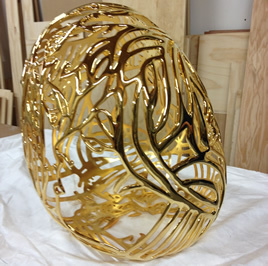 A 2 foot high cast bronze egg. An art work that Epner polished and laser goldplated for a gallery in Europe. Critical housing for the Geostationery Lightning Mapper. 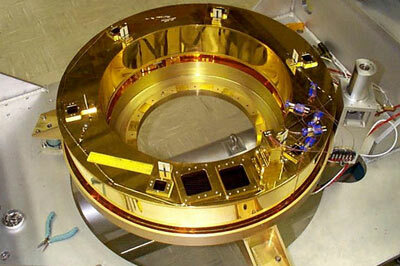 Laser Gold plated to help maintain thermal stability aboard The yet-to-be-launched GOES-R weather satellite. Laser Gold plating is a proprietary, pure, hard electrochemically deposited gold coating that combines the theoretical reflectivity and emissivity of gold, with a surface that can actually be physically cleaned! Epner works in accordance with all applicable ASTM, AMS, MIL, and Prime Contractor specifications. Epner maintains a Quality System implementing ISO 9001:2008. 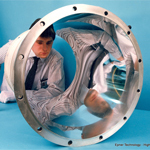 Epner Technology manufactures custom designed Infrared Light Pipes, Hollow Waveguides and Homoginizers. 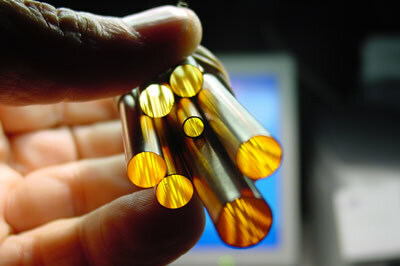 These are tubes lined with a highly polished infrared reflective coating of Laser Gold. 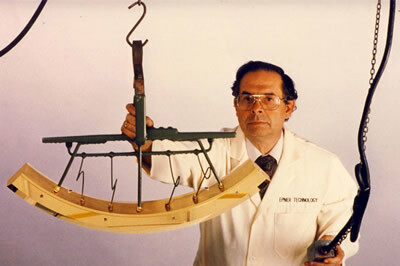 Some of the earliest patents for plating on plastics were owned by Epner Technology. They were for gold plating plastic military buttons and insignia during World War II, saving millions of pounds of brass being use for shell casings. Epner Technology offers an ultra pure, un-brightened, type 1 matte silver that achieves its brightness not with organic brighteners, but rather grain refiners that enhance its crystal structure. Epner Technology set up a division that draws on its high technology know-how and applies it to the world of art, sculpture and jewelry, in order to contribute to the artist’s creativity. 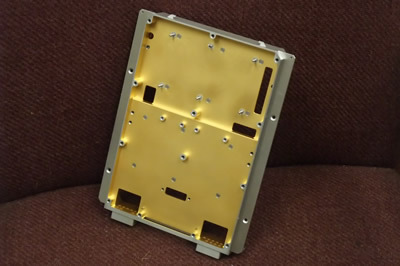 A copper foil .001″ thick (0,025 mm) is coated with Laser Gold for the ultimate thermal control barrier. The auto race car market has driven the need to protect carbon fiber components from the blistering heat generated by the engine and exhaust system. We are a third-generation family-owned high-tech engineering plating company. 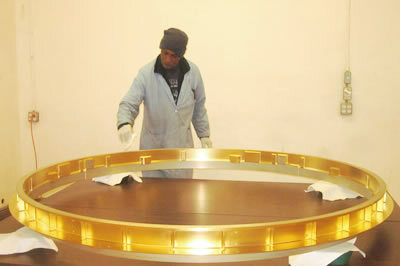 Our proprietary Laser Gold and Laser Black optical coatings are world renowned. But as you can see listed in the column on the right, we are also known as a specification plating service for aerospace companies, contract machine shops that serve them, and and other high-tech applications around the world. Epner Technolgy is dedicated to making you look smarter than we both know you really are. See our complete Mission Statement.